Playwright Martín Zimmerman, recipient of the 2012-13 Jerome Fellowship and author of such plays as “White Tie Ball,” “The Making of a Modern Folk Hero,” and “The Solid Sand Below” (presented this past summer as part of the Goodman Theatre’s Playwrights’ Unit program), is the ALTA Artist for the Month of September. 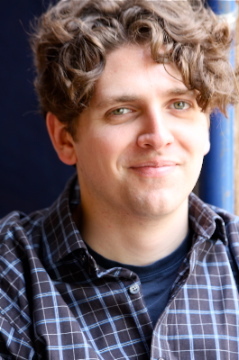 Awarded by the Playwrights Center in Minneapolis, the Jerome Fellowship provides “emerging American playwrights with funds and services to aid them in the development of their craft.” Zimmerman stands with good company: past awardees include critically acclaimed and award-winning playwrights Kristoffer Diaz and August Wilson. Martín’s plays have been produced or developed at The Kennedy Center, Goodman Theatre, Victory Gardens Theater, Chicago Dramatists, Teatro Vista, The University of Texas at Austin, and Duke University, among others. He is currently a Resident Playwright at Chicago Dramatists. Gaithersburg, in the Maryland suburbs of Washington, DC. How would your grandma describe you? Hmmm. This is a difficult one to answer. I never knew one of my grandmas and the other was… well, let’s just say she was a little intense. I didn’t meet her until I was in middle school. And she probably would’ve described me as wanting too much affection from her and not leaving her alone enough. Though I think that’s how she might have described most people in the world. She pretty much wanted to sit on the couch all day and watch AMC (in the days when it really just showed “movie classics”) without anyone talking to her. So, I don’t know how revelatory that answer is about me specifically. When you’re asked the question, “what do you do?”, what do you answer? What would you LIKE to answer? What’s one thing most people don’t know about you? Any special talents? Let’s see… I took voice lessons for four-and-a-half years, beginning at the end of high school and continuing throughout all of college, so I guess I’m a pretty good singer. That’s usually something people don’t discover about me until we do karaoke together. I also played competitive volleyball in high school. I arrived relatively late to theater compared to a lot of people in the field because I was mainly playing sports in high school. What was the first piece of theatre you ever experienced? If you count theatre I’ve participated in, it was probably a small class play in kindergarten. I believe it was “The Three Billy Goats Gruff” and I was the Billy Goat Number Three, which was actually a pretty small role compared to the others. Why do you think you got into theatre? While I don’t believe in saying anything is inevitable, I do think I might have eventually wound up partaking in theater in one way or another even if I weren’t a playwright. When I was a kid, and we would watch movies at home as a family, I would often lay out “props” beside the screen, and act out the movie while we were watching it. While this habit was rather divisive among my family, later in my life I’ve come to understand that this is how I best process information, stories, etc. By doing, acting out. For example, if I haven’t been to your house and you give me directions, the first time I go there will be a bit of a disaster because I haven’t done it yet. It’s very stressful for me. But once I’ve done it, rehearsed it a couple times, I understand it. I’m also bad at finding things. Like if you tell me go get the hammer and you describe to me where it is, I’m pretty useless at finding it. Because I haven’t enacted, rehearsed that particular search before. I like to think that writing plays, inhabiting the minds of my characters, trying to have them tell their stories through me, is how I try to understand and explore the world and people around me. What’s coming up for you? Any cool projects you want to tell us about? I’m beginning my year as a Jerome Fellow at The Playwrights’ Center, which is very exciting. I’m always thrilled to cultivate community in a new place. I’m also honored that my play “Seven Spots on the Sun’” was selected for Marin Theatre’s Sky Cooper New American Play Prize, which means I’ll get to go to the Bay Area for the first time and work on a play there. And I’m starting to work on a brand new play, which is always scary and exciting at the same time. So exciting to read more about Martín. Congratulations on all the good!